What is the AIM Program About? Aid to Injured Motorcyclists (AIM) is a free legal services program from attorney Richard Lester and our affiliated law offices in every state and Canadian Province. It is a nationwide effort to serve the legal needs of the motorcycling community. Many motorcycle riders are not aware of their rights, and we want to change that by passing along information to as many bikers as we can, so that they can ride protected. One of our most popular items is a foldable declaration of rights and how to talk to the police. It’s not illegal to be a biker and you have rights. 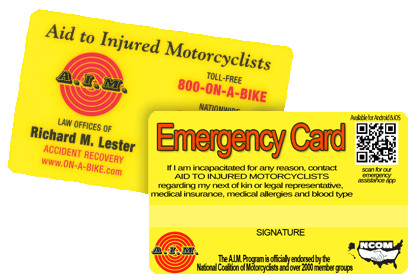 In addition to providing bikers with information about their rights as riders, we also provide a free emergency card (the AIM Card) to anyone signs up for AIM. What does this card do for me? With an AIM card, your medical information, including blood type, medical issues and current medications will be relayed to emergency medical personnel as soon as they give us a call. Our 24-hour hotline (1-800-ON-A-BIKE) is always available because we know that an accident doesn’t only happen between 9 and 5. In addition to providing your medical information, we also call the person you listed as your emergency contact so that they can know about your status. How much does it cost to join this program? AIM is 100% Free to all motorcyclists and it will always be free. There are currently over 2 Million AIM Members throughout North America. Click Here to Join AIM Today! AIM Cards offer emergency medical information and next-of-kin notification services. Getting your crucial information to those that need it most. Each AIM Card comes with a keychain attachment for your keys. Lose them? We’ll mail them back to you free of charge. What’s the catch? How can this be free with no strings attached? This program is sponsored by The Law Offices of Richard M. Lester and our affiliated lawyers from throughout the United States. We take a portion of our attorney fees from our wins, and use those fees to provide AIM services for free to any motorcyclist that signs up. You are never under any obligation to hire us, we just want more bikers to have this card as an added protection should they ever get into an accident. The benefits sound good, but why would I want another card to carry around? The AIM Card could save your life. Consider this scenario: You are out for a ride and a car blows through a red light and hits you. You did everything to protect yourself: you rode safe, checked every intersection and had a green light. The force of the accident causes you to black out and you’re hurt really bad. You have your cell phone with you, but it got broken because of the violent nature of the crash. The first goal of Emergency Services is to stabilize and transport you the hospital. They have no idea about your current medical history, or who to contact to let them know you had a motorcycle accident. When your life is on the line, you can never be too safe. Carrying an AIM card is one way to do everything you can to protect yourself. In addition to providing medical protection and a legal resource, AIM is also the sole financial sponsor of the National Coalition of Motorcyclists. The AIM attorney legal fees (a percentage of your damages only if there is a recovery), are equal and in some cases, lower than other attorneys. These fees are in part, donated back to finance N.C.O.M. However, being an AIM member does not obligate you to use any of the AIM attorneys. Consumer Protection – making roads safe for motorcyclists and creating liability if they’re not. Education – informing the general public of the problems of motorcyclists and continuing the ‘Know Your Rights’ talks and the AIM/NCOM legal/legislative newsletter so that all motorcyclists will be aware of their rights and thus, be able to protect them. Assistance to the Injured Motorcyclist – volunteers that will go to any motorcyclist that has been involved in an accident, inform him/her of all rights and help in their hour of need.